Designed to prepare you in a positive and empowering way for the birth of your baby Marie Mongan Method. Ideal for hospital, home birth, with OB or midwife, for vaginal or cesarean birth. 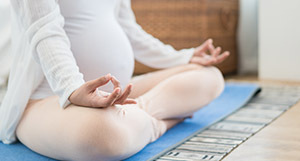 Learn: Deep relaxation, how to create your body’s own natural relaxant, how to involve your birthing companion, tools for a shortened labour, techniques for a gentle, calm birth. Birth Recovery Support: Support will include exploring mindfulness for post-birth, postpartum depression and birth trauma. Next series begins Tuesday, March 5, 2019 at 7:00 – 9:30 pm. Register online by clicking here or by calling us at 905-239-1102. Beginner to intermediate – suitable for all ages, abilities, and prenatal/postnatal stages. Taught by certified yoga teacher, Swaati Mehra-Ramcharan. Yoga helps stretch and strengthen the whole body — front, back and sides, improving your range of motion and circulation. Yoga can decrease back, hip and pelvis pain. 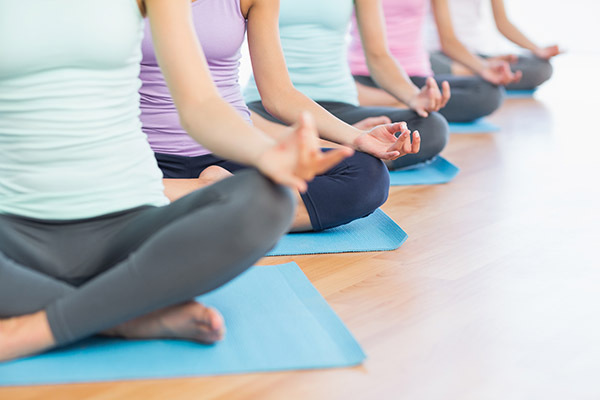 This series of small group therapeutic yoga classes are safe, will be tailored to your needs with a focus on your pelvis, back and hips, and provide you a blissful moment to breathe. Make-up classes for missed attendance not available. Classes now offered for $10/class or 6 for $55* for everyone, patients or not.